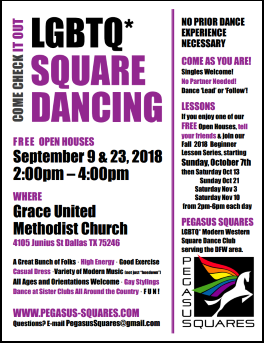 Pegasus Squares is a DFW-based Modern Western Square Dance Club, providing outreach to the LGBTQ community and its supporters. We meet weekly on second and fourth Sunday afternoons from 2-4 PM at Grace United Methodist Church (directions below). Everyone is welcome so please join us! We will be holding beginner lessons this Fall. Come join us at one of our free Open Houses on Sunday, September 9th and Sunday, September 23rd from 2-4 pm. No prior experience is required! You've never met a finer group of folks than our dancers. 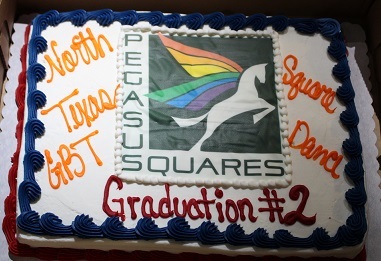 Pegasus Squares is part of a larger LGBTQ Square Dance family that hosts dances all over the country. The dance program is standardized so you will be able to travel anywhere and dance. Square Dancing is truly "Friendship set to Music!" 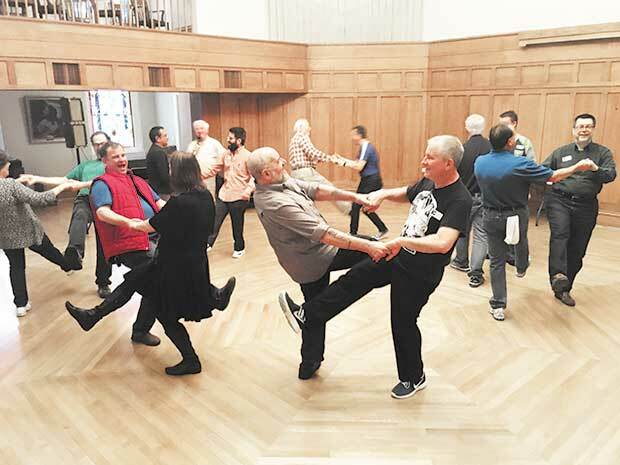 With all its moving, twisting, and turning, Modern Western square dancing provides more than the daily dose of heart- and bone-healthy physical activity. Remembering all the calls — from "Dosado" to "Allemande Left" — keeps the mind sharp, potentially staving off age-related memory loss. Don't think square dancing means listening to "square" country music. Sure, we enjoy our hoe-downs! But square dance music is so much more. Practically any music can be used for square dancing. Come check out the tunes! Pegasus Squares has many couples in its membership, but as far as dancing is concerned, it is a singles club. You can "dance with the one what brung you" or with any of our dancers, many of whom can dance both the boy's and girl's parts! No formal square dance attire is required! Our dress is extremely causal — shorts and T-Shirts are "de rigueur" in the hotter months! Pegasus Squares welcomes everyone without regard to race, religion, gender, sexual orientation, gender identity or gender expression. Join us for our open houses! Bring your friends! Once you see how much fun square dancing is at one of our two Open Houses, join us for 5 4‑hour sessions while we teach you the entire Basic and Mainstream levels! We call these "blast classes" since they teach you the beginning levels in a 5-week compressed timeframe (normally 15 weeks). There will be plenty of Angels (experienced dancers) to help you during lessons. We have found that these blast classes are a very effective way to bring you up to speed and on a path to a lifetime of fun and friendship set to music! You will be able to dance with Pegasus Squares or with any of the 1000s of other Modern Western Square Dance clubs in the US and abroad! Pegasus Squares hosted its first fly-in in March, 2017. It was successful beyond our wildest dreams with over 100 dancers in attendance! We are hosting it again March 1-3, 2019. Check out our web site Scoot Back to Big D to get an early-bird registration – only $100 through October 31, 2018! You will be joined by folks from other local clubs and square dancers from across the country for 15 hours of dancing featuring world-class callers! Square Dancing has been an important part of my life for the past 20 years. I have made many lifelong friends all over the country. It's hip to be square! I've been in gay square dance for over 15 years and enjoy the local dances and lessons as well as international conventions and regional fly-ins. Great exercise, fun and laughter, mental challenges and beautiful complex formations. My partner and I look forward to our Sundays dancing with the other dancers to great callers. A really fun 'workout' for body and mind. Great low-impact exercise for the mind and body! The most fun with great people you'll ever have walking! I enjoy meeting new friends and socializing. Square dancing brings back many good memories dancing with my parents and everyone just likes to have fun. Great exercise too! Great fun, great dancing and the chance to make great new friends. What could be better? Well, come find out! Pegasus Squares is full of fun and friendly people who like to square dance. It's a great way to get some fun exercise and to meet some really interesting people. Square dancing is so retro, it's trending again! Come join the fun. I love square dancing as it is a great way to get exercise, and meet some great people. Both good mental and physical exercise, plus lots of fun! Pegasus Squares is as fabulous as I am! Check out this article from a few years ago about the founding of Pegasus Squares in the Dallas Voice! And also check out this article that was published about our first Fly-In! Pegasus Squares is a private, not-for-profit association whose purpose is to provide social, educational and recreational opportunities within the framework of Modern Western Square Dancing for the lesbian, gay, bisexual, transgender, queer and questioning (LGBTQ*) community and their friends.